موسائی, امین, پناهی کالوس, حامد. (1395). حل دقیق هدایت حرارت غیر‌خطی دایم در پوسته‌های جدار ضخیم استوانه‌ای و کروی مدرج تابعی نمایی و خواص مواد تابع دما. 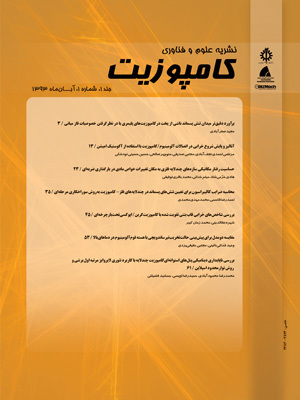 علوم و فناوری کامپوزیت, 3(3), 301-306. امین موسائی; حامد پناهی کالوس. "حل دقیق هدایت حرارت غیر‌خطی دایم در پوسته‌های جدار ضخیم استوانه‌ای و کروی مدرج تابعی نمایی و خواص مواد تابع دما". علوم و فناوری کامپوزیت, 3, 3, 1395, 301-306. موسائی, امین, پناهی کالوس, حامد. (1395). 'حل دقیق هدایت حرارت غیر‌خطی دایم در پوسته‌های جدار ضخیم استوانه‌ای و کروی مدرج تابعی نمایی و خواص مواد تابع دما', علوم و فناوری کامپوزیت, 3(3), pp. 301-306. موسائی, امین, پناهی کالوس, حامد. حل دقیق هدایت حرارت غیر‌خطی دایم در پوسته‌های جدار ضخیم استوانه‌ای و کروی مدرج تابعی نمایی و خواص مواد تابع دما. علوم و فناوری کامپوزیت, 1395; 3(3): 301-306. در این مقاله یک راه حل تحلیلی دقیق برای هدایت گرمایی درون یک ماده مدرج تابعی که خواص مواد آن دارای تابعیت نمایی نسبت به مکان و تابعیت خطی نسبت به دما داشته باشد، ارائه شده است. به‌دلیل وابستگی خواص مواد به دما، معادله حاکم غیر خطی شده و نمی‌توان آن را به‌طور مستقیم حل کرد. اساس روش حل تحلیلی پیشنهاد شده استفاده از یک تبدیل انتگرالی می‌باشد، که این تبدیل معادله میدان دمای غیر‌خطی را به یک معادله خطی تبدیل می‌کند. همچنین لازم است شرایط مرزی مناسب توسط تبدیل به‌کار رفته، استفاده شود. سپس معادله خطی شده حل و سپس میدان دمای تبدیل یافته به‌دست می‌آید. پس از آن از یک تبدیل معکوس استفاده می‌شود تا میدان دمای فیزیکی به‌دست آید. در نهایت از این روش دو مسئله هدایت درون یک استوانه یک بعدی در جهت شعاع و مسئله هدایت درون پوسته کروی حل می‌شود. برای اعتبارسنجی و اطمینان از حل ریاضی انجام شده، نتایج با حل عددی مسئله مقایسه و تطابق کاملی مشاهده شد. Zhang, H. Kan, W. and Hu, X., “Green’s Function Approach To The Nonlinear Transient Heat Transfer Analysis Of Functionally Graded Materials”, Int. J. Therm. Sci., Vol. 71, pp. 292-301, 2013. Moosaie, A., “Axisymmetric Steady Temperature Field In FGM Cylindrical Shells With Temperature-Dependent Heat Conductivity And Arbitrary Linear Boundary Conditions”, Arch. Mech, Vol. 67, pp. 233-251, 2015. Moosaie, A., “A Nonlinear Analysis Of Thermal Stresses In An Incompressible Functionally Graded Hollow Cylinder With Temperature-Dependent Material Properties”, Eur. J. Mech. A/Solids, Vol. 55, pp. 212-220, 2016. Azadi, M. and Azadi, M., “Nonlinear Transient Heat Transfer And Thermoelastic Analysis Of Thick-Walled FGM Cylinder With Temperature-Dependent Material Properties Using Hermitian Transﬁnite Element”, J. Mech. Sci. Tech., Vol. 23, pp. 2635-2644, 2009. Obato, Y. and Noda, N., “Thermal Stress In Hollow Circular Cylinder And A Hollow Sphere Of A Functionally Graded Material”, J. Thermal Stresses, Vol. 14, pp. 471-487, 1994. Ootao, Y. Akai, T. and Tanigawa, Y., “Three-Dimansional Transient Thermal Stress Analysis Of A Nonhomogeneous Hollow Circular Cylinder Due To A Moving Heat Source In The Axial Direction”, J. Thermal Stresses, Vol. 18, pp. 497-512, 1995. Lutz, M. P. and Zimmerman, R. W., “Thermal Stresses And Eﬀective Thermal Expansion Coeﬃcient Of A Functionally Graded Sphere”, J. Thermal Stresses, Vol. 19, pp. 39-54, 1996. Zimmerman, R. W. and Lutz, M. P., “Thermal Stress And Eﬀective Thermal Expansion In A Uniformly Heated Functionally Graded Cylinder”, J. Thermal Stresses, Vol. 22, pp. 177-188, 1999. Tanigawa, Y. Morishita, H. and Ogaki, S., “Derivation Of System Of Fundamental Equations For A Three-Dimensional Thermoelastic ﬁeld With Nonhomogeneous Material Properties And Its Application To A Semi-Inﬁnite Body”, J. Thermal Stresses, Vol. 22. pp. 689-711, 1999. Awaji, H. and Sivakumar, R., “Temperature And Stress Distributions In A Hollow Cylinder Of Functionally Graded Material: The Case Of Temperature-Dependent Material Properties”, J. Am. Ceram. Soc., Vol. 84, pp. 1059-1065, 2001. Kim, K. S. and Noda, N., “Green’s Function Approach To Unsteady Thermal Stresses In An Inﬁnite Hollow Cylinder Of Functionally Graded Material”, Acta Mech. Vol. 156, pp. 145-161, 2002. Jabbari, M. Sohrabpour, S. and Eslami, M. R., “Mechanical And Thermal Stresses In Functionally Graded Hollow Cylinder Due To Radially Symmetric Loads”, Int. J. Pressure Vessels Piping, Vol. 79, pp. 493-497, 2002. Jabbari, M. Sohrabpour, S. and Eslami, M. R., “General Solution For Mechanical And Thermal Stresses In A Functionally Graded Hollow Cylinder Due To Nonaxisymmetric Steady-State Loads”, ASME J. Appl. Mech., Vol. 70, pp. 111-118, 2003. Liew, K. M. Kitipornchai, S. Zhang, X. Z. and Lim, C. W., “Analysis Of The Thermal Stress Behaviour Of Functionally Graded Hollow Circular Cylinders”, Int. J. Solids Structures, Vol. 40, pp. 2355-2380, 2003. You, L. H. Zhang, J. J. and You, X. Y., “Elastic Analysis Of Internally Pressurized Thick-Walled Spherical Pressure Vessel Of Functionally Graded Materials”, Int. J. Pressure Vessels Piping, Vol. 82, pp. 347-354, 2005. Zhao, J. Ai, X. and Li, Y. Z., “Transient Temperature ﬁelds In Functionally Graded Materials With Diﬀerent Shapes Under Convective Boundary Conditions”, Heat Mass Transfer, Vol. 43, pp. 1227-1232, 2007. Chen, Y. Z. and Lin, X. Y., “Elastic Analysis For Thick Cylinders And Spherical Pressure Vessels Made Of Functionally Graded Materials”, Comput. Mater. Sci., Vol. 44, pp. 581-587, 2008. Asgari, M. and Akhlaghi, M., “Transient Heat Conduction In Two-Dimensional Functionally Graded Hollow Cylinder With ﬁnite Length”, Heat Mass Transfer, Vol. 45, pp. 1383-1392, 2009. Peng, X. L. and Li, X. F., “Thermo-Elastic Analysis Of A Cylindrical Vessel Of Functionally Graded Materials”, Int. J. Pressure Vessels Piping, Vol. 87, pp. 203-210, 2010. Wang, H. M., “An Eﬀective Approach For Transient Thermal Analysis In A Functionally Graded Hollow Cylinder”, Int. J. Heat Mass Transf., Vol. 67, pp. 499-505, 2013. Perkowski, D. M., “On Axisymmetric Heat Conduction Problem For FGM Layer On Homogeneous Substrate”, Int. Commun. Heat Mass Transf., Vol. 57, pp. 157-162, 2014. Moosaie, A., “Steady Symmetrical Temperature ﬁeld In A Hollow Spherical Particle With Temperature-Dependent Thermal Conductivity”, Arch. Mech., Vol. 64, pp. 405-422, 2012.